In January, SkyTeam picked up the 2009 "Best Airline Alliance" Global Traveler Award for the fifth consecutive year. In March, SkyTeam was prominently present at the ITB Berlin. The ITB is the largest travel trade show in the world and attracts exhibitors, professionals, visitors and media from all sectors of the international travel and tourism industry. SkyTeam was a premium sponsor of the ITB Aviation Day, where executives and aviation industry experts elaborated on developments in the aviation industry. Mauro Oretti, Vice President Sales and Marketing, provided a SkyTeam perspective on the role of global alliances in fostering deeper integration among the world's airlines. In March, China Southern Airlines announced its plans to join SkyTeam Cargo. With full membership in SkyTeam Cargo expected before November this year, China Southern Airlines will become the first Chinese carrier to join a global air cargo alliance. In April, China Eastern Airlines announced its intention to join the SkyTeam Airline Alliance in 2011. With the addition of a second Chinese airline, SkyTeam customers worldwide will benefit from greater access to China and Asia Pacific. Current SkyTeam member China Southern already covers China through its hubs in Guangzhou and Beijing. Together with China Eastern and its hub in Shanghai, SkyTeam will be able to offer services out of the three major Chinese markets. China Eastern will bring 25 unique new destinations that will enrich SkyTeam's current network. In June, during festive ceremonies in Hanoi and Bucharest respectively, Vietnam Airlines and TAROM Romanian Air Transport officially joined the SkyTeam Airline Alliance. On June 22, SkyTeam marked a special milestone with 10th anniversary of the alliance. 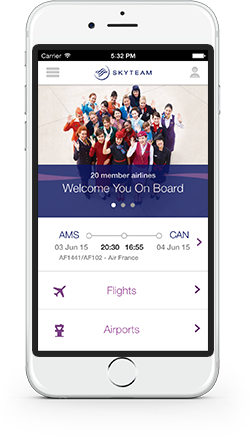 After being founded by four partners on June 22, 2000, SkyTeam has grown to an alliance thirteen members, now offering its 384 million annual passengers a worldwide system of approximately 13,000 daily flights covering 898 destinations in 169 countries. In September, China Airlines, the flag carrier of Taiwan, formally announced the start of its joining process leading to full entry into the SkyTeam Airline Alliance. The process is expected to be completed by mid-2011. The announcement comes just a few months after China Eastern signed an agreement to join SkyTeam. The addition of China Airlines to the alliance complements the well anchored position of China Southern, solidifying the unrivalled presence of SkyTeam in Greater China. With China Airlines as a partner, SkyTeam customers will benefit from further improved access to SkyTeam's extensive Asia Pacific network. In November, Shanghai Airlines announced it will become part of SkyTeam under the wings of parent company China Eastern, which is already in the process of joining the alliance. Both Shanghai-based airlines are scheduled to join SkyTeam in mid-2011. China Eastern and Shanghai Airlines will increase the SkyTeam presence in the region as their combined networks add up to that of Guangzhou-based member China Southern. Including China Airlines from Taipei, these four members will cement SkyTeam's No. 1 position in the Greater China region. Garuda Indonesia, the flag carrier of Indonesia, signed an agreement to join SkyTeam in 2012. Garuda will expand SkyTeam's presence in Southeast Asia. SkyTeam is actively working to grow its presence in the region and Garuda is a very welcome addition to the alliance. Garuda has a broad Indonesian and regional network and is able to offer additional coverage and improved connections to the Asia Pacific. Some of the 30 new destinations in the SkyTeam network are Surabaya in East Java, Medan in North Sumatra and Perth in Australia. Garuda's consideration to expand its intercontinental network to Frankfurt, Paris, London and Rome will make the airline an increasingly attractive option for business and leisure travelers. Garuda Indonesia was named the 'World's Most Improved Airline' at the Skytrax 2010 World Airline Awards. Aerolíneas Argentinas, the flag carrier of Argentina, signed an agreement to join SkyTeam in 2012. Aerolíneas will be SkyTeam's first South American member. SkyTeam is actively working to strengthen its presence in Latin America, a region with strong growth figures and a positive outlook for the future. Aerolíneas Argentinas fits well in SkyTeam's expansion strategy, enhancing the network in the region by offering multiple new destinations in the southern hemisphere. The extensive domestic and regional service of Aerolíneas Argentinas brings 38 new destinations to the SkyTeam network, including Córdoba, Mendoza, Asunción and Montevideo. With Buenos Aires serving as a Latin American hub with flights to and from key destinations in the region, SkyTeam customers will benefit from improved access to the southern part of South America and Patagonia in particular, popular destinations with travelers from all over the world.